Descubre los encantos de Kerala en un tour de 6 noches desde Kochi. 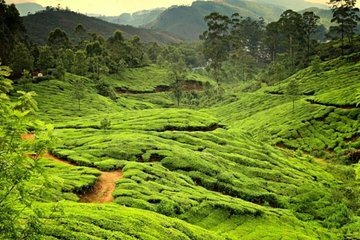 Visite las plantaciones de té en las colinas de Munnar, tome un safari por la naturaleza en el Parque Nacional Periyar, descanse en la aislada playa Varkala en Kollam y navegue por los tranquilos remansos de Alleppey y pase la noche en una casa flotante. Su recorrido incluye seis noches de alojamiento, la mayoría de las comidas y actividades, transporte en vehículo privado y un guía privado. Incluye alojamiento, transporte y actividades. Aprende de la guía sobre la historia y la cultura de Kerala. Although all the hotel accommodation was very satisfactory the hotels themselves were located too far away from shops and restaurants. The Houseboat boat tour of the Kerala Backwaters was the highlight of the tour. The purchasing of this package primarily gives you the hotels which are super duper nice for the price- way more upscale than expected and really made the trip more special, the breakfasts, and the driver. Especially as a non-Indian American, and as a less proficient world traveler, having a driver is essentially a must to get around safely and easily between the important sites of Kerala. We had the same driver for the entirety of our 7 days in Kerala. First of all, he kept us safe. Driving in India can be scary and our driver always made the ride feel very smooth while at the same time getting us from place to place in a prompt fashion. He gave us good directions on how to navigate situations interacting with locals such as where to walk or not walk, and how to tip, etc. Secondly, he did a good job of offering us places to stop and sites to see. He suggested things and asked our preferences, and this really enhanced our experience, by revealing to us places we would have not known to seek out on our own the Coir Museum, the lighthouse in Aleppey, etc. Also, when we had a general desire, such as to see a beach in a certain place, he had great insight into which beach in that area would be best, cleanest, and most enjoyable. He also was very agreeable with our various requests. He accommodated the type of food we sought, and identified ideal restaurants for us. If we suddenly needed something such as a bathroom or ATM, Sam made it happen. We had no major concerns or complaints. One of the only things we would modify was that if our driver knew a little more english, it may have further helped him teach us about the sites we were seeing. He could definitely answer basic questions and meet our needs but may have missed out on getting to ask some more detailed questions about history, culture, etc. Along with this, something that may just be a function of how to get around this area and not actually a specific issue with this tour: I felt like we spent a lot of time in the car and were so insulated/sheltered from the local people. The exception to this was being shown fun local restaurants. That said, when we were provided chances to walk on our own down a street we were so bombarded with people selling us things that it was sometimes not worth it, so maybe this is deliberate. Generally, people doing this tour should be okay with significant car rides between destinations. For BoutIndia in general, we thank them as well for the great experience as described above. Additionally, our correspondence with all of BoutIndia leading up to our travels were prompt, clear, reassuring, and accommodating. Thank you for this unforgettable experience as we explored Kerala! Other side note- travelers who are birders- this was a good trip for avian diversity! We only made about a 60 percent effort to identify all the birds that came by and we saw dozens of interesting species. The hike in munnar showed us a lot of great song birds, and you get all the water fowl on the houseboat. Tea factory/museum at Munnar was a little weak on info and presentation. Guy giving explanations was speaking English but very difficult to understand and was wildly tangential in what he talked about, so we left wishing we actually received basic teaching on how the tea was grown. But the tea plantation views and mountain views and the trekking in Munnar were all great and like what you see in the pictures. Note that some places that you would expect to be scenic and beautiful really are, and others have a lot of garbage- this is just a reality of India and the intersection of its natural wonders with its dense populations, etc. For example- Verkala beach is pristine along the water and the area where people sit, while Kollam beach is covered with garbage but still had fun being there at sunset when we first arrived in Kollam, and also seeing where the locals go and such. The lake that can be visited in Periyar park during your time in Thekkady is actually littered and crowded and you cant actually go to the shore of the lake- its gated off only as a path for those paying for the boat-ride. This was a well-organized good value for money tour organised by Bout India Tours. From both initial contact to during the tour they were in constant contact with quick response times to any query we had, and they went out of their way to accommodate any extra request. Our driver made us feel safe and comfortable and nothing was too much trouble. We enjoyed seeing the many sights of Kerala, including the visit to the spice plantation, the tea factory, the jeep safari the stay and Mistletoe hotel and the day at Varkala beach where you can hire umbrellas and beach chairs and swim in the warm ocean. We traveled as a family four adults three children so we were able to amend the itinerary slightly as needed. Wonderful experience with well selected hotels, tourguide-driver. Well supported by outfitters.